Left Coat Libations San Francisco Launch Event, September 18th, Heaven’s Dog, 9 PM till closing. You know that book I’ve been working on for the past couple of years? Well, it’s out. To celebrate (and sell some books, let’s face it, that’s what we’re trying to do) we’ll be holding launch events in each of the Left Coast cities over the next month and a half. The first (and certainly the biggest and best) will be held in San Francisco this Saturday (September 18th) at Heaven’s Dog (and yes, Erik Adkins will be there). The details are below. I expect all of my faithful readers (I think there are about 11) to join us. A splendid time is guaranteed for all! Where: Heaven’s Dog, in the Soma Grand, at 1148 Mission Street between 7th and 8th Streets in San Francisco. When: Saturday, September 18th, from 9 PM until closing. A number of Left Coast bar talent will be on hand as ‘special guests’ throughout the evening, some from out of town. We will have books for sale (courtesy of Green Apple). If you can drag yourself away from the tasting tables, there are also seminars to attend, each about 45 minutes in length. (Admission included in the price of your ticket, but space is limited.) Richard Patterson (Master Blender, Whyte and Mackay) will be giving his (in)famous, expletive-laden lecture on The Dalmore, complete with tasting and ice throwing. Fritz Maytag (Anchor Distilling Company), Neyah White (Brand Ambassador for Yamazaki) and Parker Beam (Master Distiller for Heaven Hill) will also be giving talks, though unfortunately their seminars run in parallel with one another so you’ll have to make a tough choice. A complete list of seminars can be found by clicking here. It’s not very well advertised but there’s an incredible buffet of hot and cold food available before and then during the event. (And yes, that’s included in the price of your ticket too!) So there’s no reason to eat dinner before arriving. They even switch over to deserts toward the end of the evening, just to round things out. A perfect time to sample the Compass Box Orangerie or Germain-Robin XO. Oh, and you also get use and take home a lovely little Glencairn tasting glass. 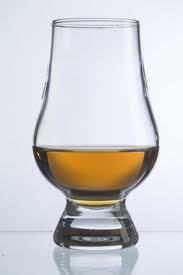 That’s actually the “official” whisky tasting glass, sometimes known as a nosing glass. I’ve found it works equally well with whiskey too! Tickets to WhiskeyFest San Francisco 2010 (Regular admission $110; VIP admission $150) can be purchased on-line by clicking here. [*] – Unfortunately, I have learned that the Rickhouse crew will not have a booth at this year’s event—though they will be participating in WhiskyWeek, a broader set of activities throughout the city, that run from October 4th through the 9th. Details on those activities can be found as they become available here. Emboldened by my recent success with apricots (previously), I decided to undertake some further exploration of stone fruit, again, before they completely disappear. But this time I set myself a slightly different challenge. I wanted to capture stone fruit flavors in a spirit so they could be used for mixing after the season was over. Motivations were two: first, I wanted to learn more about how best to do that and then play with the resulting flavors. Second, because I’ve been thinking about the possibility of a signature cocktail for the bar at Plum. Seems obvious you’d want something made with plums, only the bar won’t be opening until well after the end of season. Perhaps a well made infusion could capture the embers of the summer fruit season, keeping them safe and sound until needed? At any rate, you can see it was to the crosses was attracted. That’s in no small part because of the apricot component. It gave me a kind of psychic bridge from my previous success that I hoped would leave to more of the same. 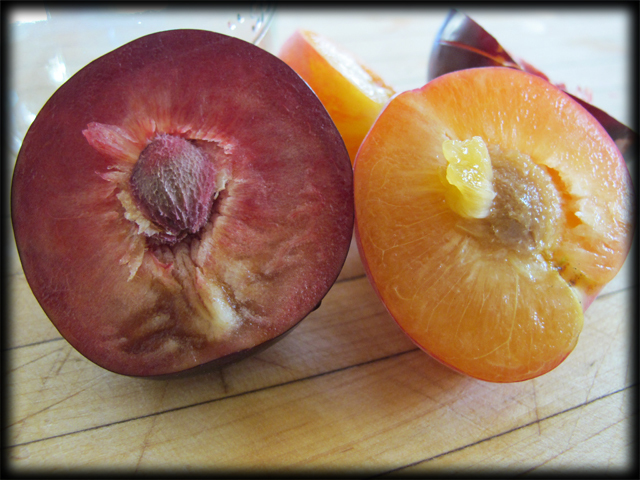 I poked and sniffed and even sampled a few pieces of fruit and finally settled on two: Rose apriums, cause they seemed like they had a lot of apricot nature, and Flavor Supreme pluots, for similar reason but they were intensely purple inside. I was also motivated by the texture of the fruit. I was concerned that very plummy fruit, with soft wet flesh would disintegrate when steeped in spirits. This seemed like it would make it hard to filter the infusion when it was ready and for some reason having a translucent (not cloudy) final product seemed important to me. Both of these varieties possessed a firmer, finer grained flesh. I also had one further idea while in the store. Perhaps I could use dried plums (but not prunes) to make an tasty infusion? I had done this with dried apricots and pisco when making Ryan Fitzgerald’s “Il Terzo” cocktail for Left Coast Libations. Perhaps I could find and use dried plums to the same effect? And the advantage of that would be, honestly, the availability of dried fruit, into fall and winter. 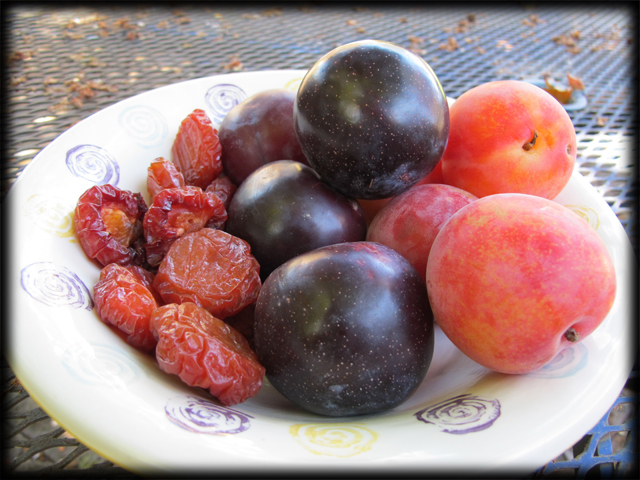 The Bowl did not disappoint: I found some rather moist (and tasty) dried plums in the bulk food section. I cut up three of each of the fresh fruit into pieces about 1/2″ on a size or smaller. (I discarded the stones.) I put the cut fruit into to one pint canning jars, added 8 oz. of Plymouth gin, sealed them up. I treated the dried fruit a little bit differently, cutting them into smaller pieces, about 1/4″ wide, to increase the surface area during infusion. I put these in a pint jar too and added 8 oz. of Plymouth. The jars are now sitting in my relatively cool (and frequently dark) basement/garage/warehouse. There are two reasons I chose to use Plymouth gin for this experiment. First, there’s a nice citrus/corriander component in the Plymouth which I always find very attactive. Its neither too juniper-ry not floral (like, say Hendrick’s). Second, Plymouth makes the best sloe gin, and sloe berries (as they are referred to) are close relatives of plums (both members of the genus prunus). So I already kind of know the two flavors can play well together. So I am going to give my infusions about two weeks, sampling them along the way. They are already taking on quite a bit of color and scent. 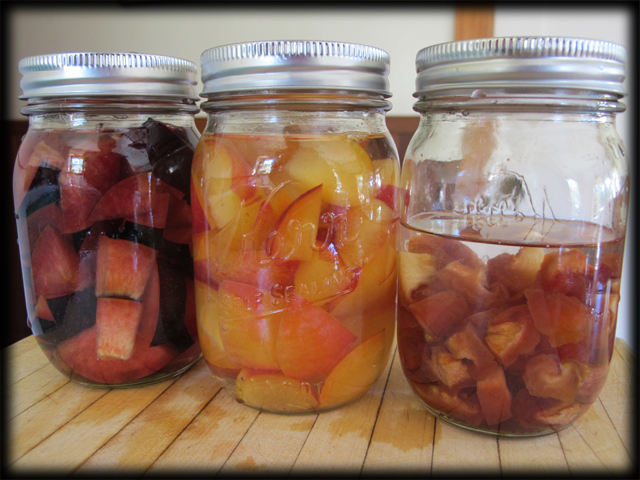 It’s also obvious that the fresh fruit is giving up a lot of liquid into the gin while the dried fruit is absorbing it. (I may even need to add some additional gin to this one.) I will let you know how all of them turn out and what sort of cocktails I come up with to showcase them in a future post. (Thinking ginger, thinking shiso.) And keep your fingers crossed I didn’t just waste most of a bottle of fine gin! Stone fruit season is definitely coming to a close. A recent trip Berkeley Bowl last week revealed the selection of apricots, plums, nectarines, and their various crosses starting to diminish. There were in fact only about two or three apricot varieties on display, way down from the dozen or so earlier in the month. Of course, what’s important about this story is that this was supposed to be the summer I overcame my traditional resistance to stone fruit and figure out how to make some original cocktails with them. While I have been known to eat (OK, take a bite of) the occasional peach or apricot, I just seem to be missing the gene that makes one crave this class of fruit. (Excepting cherries. I love cherries.) At the same time, I completely get how outrageously fortunate we are in this part of the country when stone fruit come into season and how awesome it is to use them in cocktails. Hence my resolve, which was thwarted every time I went into the market. How easily my eyes leapt from the piles of pluots and apriums towards the baskets of easy to love marion blackberries and raspberries. How simple to think of something to make with those! How quickly I forgot my good intentions to learn something new! Finally, a few days ago, I purchased some of the last apricots, Rival from Washington state. They were medium sized fruit, good looking, firm but starting to show signs of serious ripening. They even smelled like apricots, while so many reveal nothing when sniffed. This, I said to myself, was it: my last chance to make good on my promise. Thus, into a bag a few of the softer feeling fruit went. That evening, I got to work. I have admit I didn’t tinker around very much before hitting upon the recipe I am about to share. That’s mostly because on the second iteration of this fresh apricot sour, when I swapped Calvados for Laird’s 100-proof straight apple brandy, I felt I had created something so delicious, I felt no inclination to do more than sit back, sip, and savor. No rush, I told myself, there’s always next season. A half of a medium-sized very ripe apricot, cut into about six pieces. 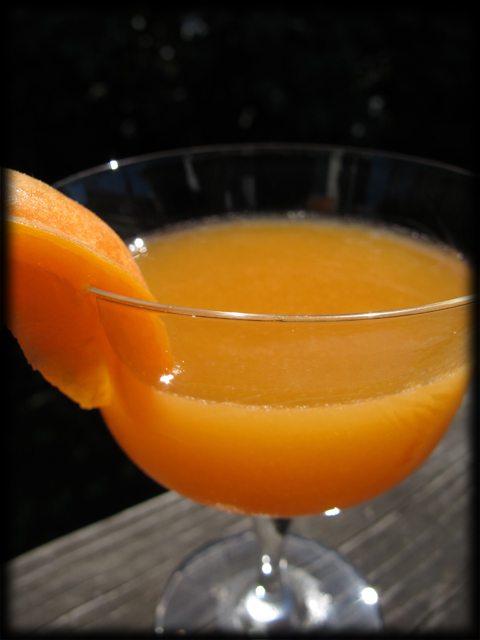 Put the cut apricot half, the lemon juice, and the orgeat into a mixing glass. Firmly muddle this mixture until the apricot is well pureed. Add the apple brandy and amaro. Fine strain into a chilled cocktail glass. Made this cocktail using the season’s last apricots, hence the name. Earlier iterations of this cocktail used Calvados and the regular Laird’s Applejack. Neither had the assertiveness necessary to balance against the fresh apricot. You may need to use a barspoon to work the cocktail through the strainer as it gets pretty thick in there.